We often associate jukeboxes with 1950s teenagers and rock and roll and such. At least I do. But the rise of the jukebox actually occurred long before Elvis was ever cued up at any Milwaukee soda shop. 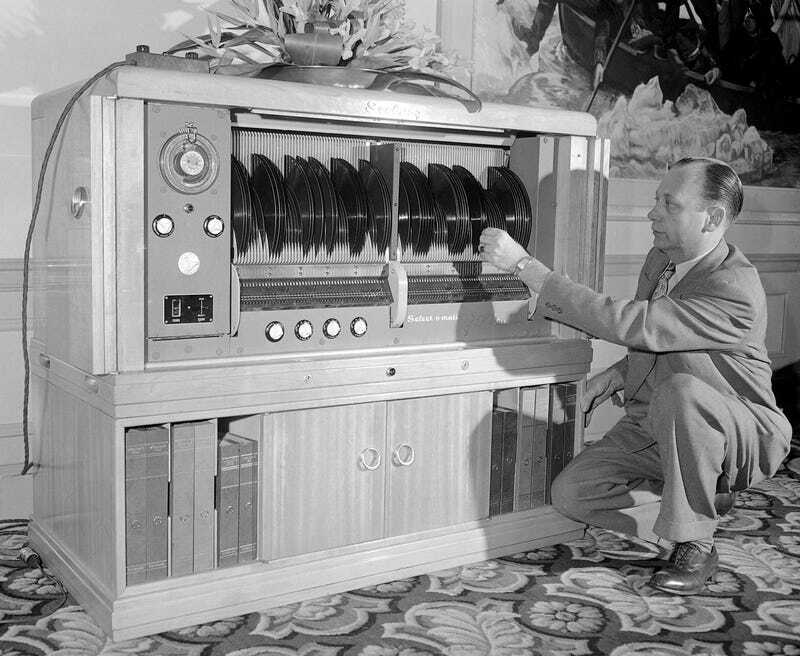 In this photo from April of 1948 we see engineer Myron Holbert, who’s showing off the Seeburg Select-O-Matic jukebox. The machine held a relatively enormous library of music — 200 selections! And although the jukebox became a symbol of the postwar teen music explosion, it predates the 1950s by decades. In fact, it was during the 1930s that America saw an incredible rise in the number of jukeboxes filling dance halls and diners. In 1933 there were perhaps 20,000 to 25,000 jukes in America. The spectacular rise began the next year with approximately 300,000 jukeboxes on site by the end of the 1930s. Postwar innovations allowed more music to be stored in a single machine. The jukebox concept of communal listening for a fee was far from new in the 1940s, as different jukebox-style devices existed as far back as the late 19th century. But what made the Seeburg machines so revolutionary were their vast selection in a single machine. Today, the jukebox has gone digital. With just a couple taps of a touchscreen virtually any song ever recorded is delivered to many modern day jukeboxes via the internet. The internet swallows everything in its path. So it should be no surprise that it would overtake the jukebox one day.